Are you an epicurean explorer, someone who seeks out exciting new food experiences? Then get thee to Las Vegas, where—both on and far beyond The Strip—you’ll find a surprising number of distinct neighborhoods dotted with diverse eateries fit for foodies. Grab some utensils, tuck in your napkin, and let’s dig in. Downtown Las Vegas offers more than just glittering gambling halls and a fancy light show. In particular, the Fremont East District has become a culinary hotspot, thanks to innovative chefs taking chances on new dining concepts. At the canteen-style coffeehouse PublicUs, start the day with avocado toast and an Espresso Old Fashioned. If you can find a table, Chef Natalie Young’s eat. is the spot for soulful breakfast fare, including tofu scrambles and corned beef hash. VegeNation makes meatless eating delicious with BBQ tofu “bao wao” buns and cashew ricotta-layered eggplant stacks. Weekends at the Kitchen at Atomic Lounge, located in a former auto garage adjacent to iconic Atomic Liquors, feature shrimp cocktails with gochujang-hinted chile sauce and beefy monkey bread. Rock out at Evel Pie, which dishes pizzas both traditional and exotic (rattlesnake sausage, anyone?). Located at The Ogden, Flock & Fowl’s specialties include succulent Hainan chicken rice and Kaya toast with foie gras. Wood-roasted veggies and viands are key at 7th & Carson, including vadouvan-dusted heirloom carrots and salmon with squid ink quinoa. And at the very cool Carson Kitchen — which revolutionized the neighborhood four years ago, thanks to the late Chef Kerry Simon — it’s all about “Devil’s Eggs,” with crispy pancetta and caviar, baked brie with bacon jam, and crispy chicken skins with smoked honey. Galleries and studios aren’t the only spots in which creativity is cooking in the Las Vegas Arts District. This funky, mural-covered neighborhood just east of the I-15 offers a growing selection of distinctive eateries. Vesta Coffee Roasters dishes breakfast sandwiches as lusciously eggy as its coffee is carefully brewed. For midday meat, cheese and bread stackers, The Goodwich is a must-do (try the weekly special). Latin American inspirations abound in Makers & Finders’ arepas and empanadas, with such ingredients as sweet plantains, chicharrones and shrimp ajillo. Kitschy ReBAR and its nearby sister establishment, Nevada Taste Site, are cool spots for cold brews, hot bratwursts and cool veggie lettuce wraps. Eats are irie at Jammyland Cocktail Bar and Jamaican Kitchen, like the 24-hour smoked jerk wings. For savory pies with a kaleidoscope of fillings, kick back at Cornish Pasty Co., which also hosts live music and events. The gluten-free pizzas at Good Pie are astounding, and the house-made pastas at Esther’s Kitchen are perfectly Italian. And at long-time staple Casa Don Juan and the revived El Sombrero, Mexican feasts await. With more than two dozen restaurants and bars, The Cosmopolitan of Las Vegas has always been a culinary destination unto itself, with hotspots such as STK, Blue Ribbon and Jaleo anchoring its vertically oriented Restaurant Collection. But with the opening of Block 16 Urban Food Hall, the center-Strip resort has leveled up, creating a distinctive—and crave-able—“neighborhood” of its own. 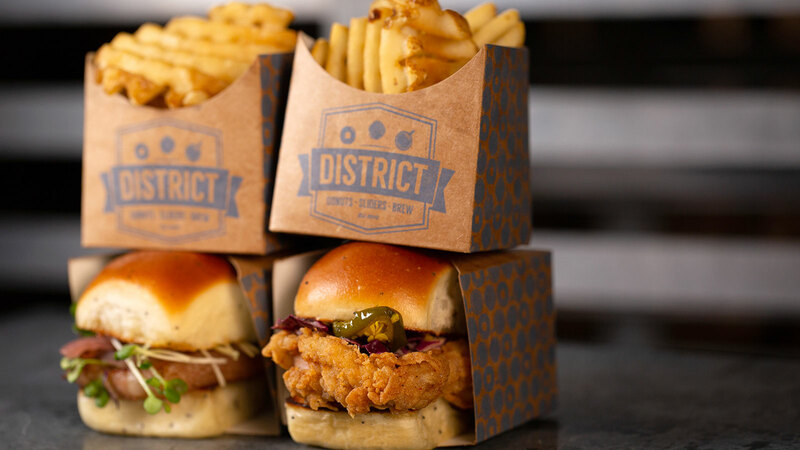 Within this industrial-chic maze are some of the best flavors sourced from around the United States, including New Orleans comfort-food legend District: Donuts. Sliders. Brew. and Nashville’s spicy soul food purveyor Hattie B’s Hot Chicken. Portland’s hip food scene is represented twice: Chef Rick Gencarelli’s Lardo, with its pork-based sandwich sensations, and James Beard Award-winning Chef Andy Ricker’s Pok Pok Wing, offering Southeast Asian street fare. Straight from New York City, Ghost Donkey Mezcal & Tequila Bar delivers a fiesta of Mexican flavors. And local restaurateur Takashi Segawa (of Monta Ramen fame) reps Vegas with Tekka Bar: Handroll & Sake. Running north-south, just east of The Strip, Paradise Road is a destination for gastronauts and conventioneers alike, even beyond the confines of its well-tread “Restaurant Row.” Bandito Latin Kitchen & Cantina stuns with its airy architecture and modern entrées such as brick-pressed roasted chicken with potatoes al pastor. Tortillas—and draft brews—reign at lively (and appropriately named) Tacos & Beer, with fillings like barbecued beef, grilled fish and jackfruit carnitas. Head to Naked City Pizza for pies like the garlicky Buffalo 22, meatball subs, penne with vodka sauce, and beyond. Recently relocated Lotus of Siam has been a destination for Northern Thai delicacies for nearly two decades, with such signature dishes as khao soi (crispy duck with egg noodles and curry sauce). Some of the finest Italian cuisine in the Southwest is created at handsome Ferraro’s Italian Restaurant & Wine Bar. If you’re looking to splurge on top-quality beef, check out power-dinner mainstays Lawry’s The Prime Rib or Del Frisco’s Double Eagle Steakhouse. Summerlin might be the definition of suburbia, but don’t let its swank, master-planned appearance fool you—foodie adventures aplenty exist among the perfectly manicured xeriscaping. Bright and bustling Flower Child features colorful wraps and bowls with healthy fillings like kale, shiitake mushrooms, sweet potatoes, sustainable salmon, and grass-fed steak. For a picnic lunch in gorgeous Red Rock Canyon, pick up a family-style order of crispy bird with fixings at Blue Ribbon Fried Chicken. Make a toast at snug Oh La La French Bistro over glasses of rosé and a shared plate of fresh-chopped steak tartare. At Khoury’s Mediterranean Restaurant, the eye-popping mezze platter features a dozen small plates filled with baba ganoush, falafel, stuffed grape leaves and more, accompanied by hearth-baked, puffy pita bread. Or, after a leisurely stroll through Downtown Summerlin, relax at Andiron Steak & Sea with a lemony lobster roll or roasted branzino with shaved fennel. With the jagged Spring Mountains for a backdrop and ornate Italianate architecture, Tivoli Village’s picturesque, colonnaded streets are home to a handful of foodie-friendly ristoranti. At sunny Hamptons, graze on small plates of preserved lemon hummus, yellowtail tuna poke, or mushroom-brie bruschetta. At Mexico-focused Leticia’s Cocina, specialties include achiote-marinated roast pork, fragrant pozole and hand-wrapped tamales — including a fiery chipotle-veggie version. When it comes to upscale chops at Tivoli Village, Echo & Rig is hard to beat—a two-story steakhouse with its own demonstration butcher shop. Santa Maria-style tri-tip, ribeye cap or Wagyu tenderloin … which will it be? Aspiring chefs and DIY enthusiasts can even load up on fresh, organic produce and handcrafted goods every Saturday at the Farmers and Makers Market. That’s no mirage—those truly are gleaming, turquoise-hued lakes hidden within the secluded northwest Las Vegas neighborhood of Desert Shores. Don’t let its suburban serenity fool you—this master-planned community is home to a formidable trio of fine eateries that afford lakeside views. Mornings and afternoons are perfect at Rooster Boy Café, where pastries and egg dishes like shakshouka and chilaquiles are served daily. At casually elegant Americana, eclectic menus range from strawberry-based gazpacho with blue cheese to squid ink spaghettini with calamari. There’s herb-crusted rack of lamb and steaks for carnivores. And for a dining destination that’s enticed visitors to the ‘burbs for nearly two decades, Marché Bacchus French Restaurant and Wine Shop remains one of the most charming scenes in the Southwest. Its food is tres delicious, too. Highlights include a lobster salad croissant sandwich, truffled goat cheese Napoleon, and pan-roasted duck with cherry reduction. Plus, sizzling steaks, of course. The sprawling southwest quadrant of the Las Vegas Valley has, over the past few years, become a worthy addition to food-lover itineraries. Notable spots include 595 Craft and Kitchen, which elevates bar grinds with a zippy tuna burger with Japanese furikake spice and arugula. Sicilian artistry is on display at Pizzeria Monzú, from ricotta-stuffed fried squash blossoms and sausage-stuffed fried olives to a thick-crust pie with piquant ‘Nduja sausage, Gorgonzola, walnuts and honey. At tiny Elia Authentic Greek Taverna, upscale gyros match advanced entrées like tsipoura (whole-grilled dorade royale with wild greens). For oysters and sashimi, Other Mama is outstanding. Andre’s Bistro & Bar wows with French stylings like escargot persillade, bouillabaisse, golden trout amandine and crème brûlée, plus a lip-smacking cheeseburger with duck fat fries. Got a sweet tooth? Cap off your drive to the district with icy artisanal treats at Gelato di Milano. Covering more than a dozen blocks, Las Vegas’ Chinatown is impressive for its gastronomic—and cultural—diversity. Start off with a cappuccino and cruffin at elaborate Gäbi Coffee & Bakery. The Japanese trio of Monta (ramen), Raku (charcoal-grilled skewers) and Kabuto (sushi) are located in a shared plaza. Locals’ fave Viet Noodle Bar serves some of the city’s best phở. Grill your own dinner and dip into a rainbow of banchan side dishes at 8oz Korean Steak House & Bar. For more interactive eating, belly up at Chubby Cattle for saucy hot pots. In Chinese choices, discover mouth-tingling Szechuan peppercorns at Chengdu Taste or relish denizens of the deep at Capital Seafood. Two stylish new eateries have brought upscale European cuisine to the neighborhood — Mordeo for Spanish-style tapas and Partage for avant-garde French flourishes. Just in the mood for bar snacks and potent tropical cocktails? The Golden Tiki is your retro dream come true. Henderson — Nevada’s second most populous city — offers a burgeoning restaurant scene 10 miles southeast of the Strip along one of its busiest thoroughfares, Eastern Avenue. Nestled in a nondescript strip mall, trendsetting café and bakery CRAFTKitchen ups the eggs Benedict game with organic salmon. The Stove pairs breathtaking views with a menu that effortlessly switches from sausage corn dogs with mustard-maple sauce to a broccoli-parmesan frittata with romesco drizzle. Boteco is a wine-forward bistro with dishes for sharing like tomato bruschetta, black garlic hummus, and velvety chicken liver pâté. At Prosecco, sip on Italian sparklers while noshing on beef carpaccio and San Daniele prosciutto antipasti. If humongous burgers topped with mac ‘n’ cheese is how you roll, make a pit stop at Truffles N Bacon. Off of Eastern, other notable eateries pepper the area: breakfast-and-lunch minded Kitchen Table and all-day global specialist Served. And some of the most exquisite Japanese specialties in the Mojave Desert are handcrafted at Kaiseki Yuzu. Although located outside the Vegas Valley proper, Boulder City’s picturesque Old Town district is worth a trip for its unique, homegrown dining—and quirky shopping–options. With an unmissable mid-century modern sign out front, Southwest Diner is the go-to for belly-warmers like huevos rancheros and chili verde. In the surfboard-decorated Coffee Cup, omelets are standouts among a Diners, Drive-Ins and Dives-approved menu. For gastropub flourishes, nosh on a lobster Reuben at The Tap, or duck into The Dillinger, where blue cheese-bacon wedge salads and burgers wash down easy with craft beers (plus free live music on Friday and Saturday). Dig into Angus beef nachos on the shaded patio at Boulder Dam Brewing Co., or fork into savory brisket at Fox Smokehouse BBQ. After sightseeing and tchotchke-buying, nibble on imported fromage with sips of wine at a sidewalk table at quaint Milo’s Cellar. Has anyone tried “Eat” in the downtown area? Amazing food!!! Homemade food pushed up a few notches!!!! Their killer grilled cheese and tomato soup are to “dye for!” Portions are big, and well-worth the price which is reasonable!!!! Hi Carole – Of course, we love eat! It’s mentioned in the “Downtown” section of the story. Chef Natalie rocks.